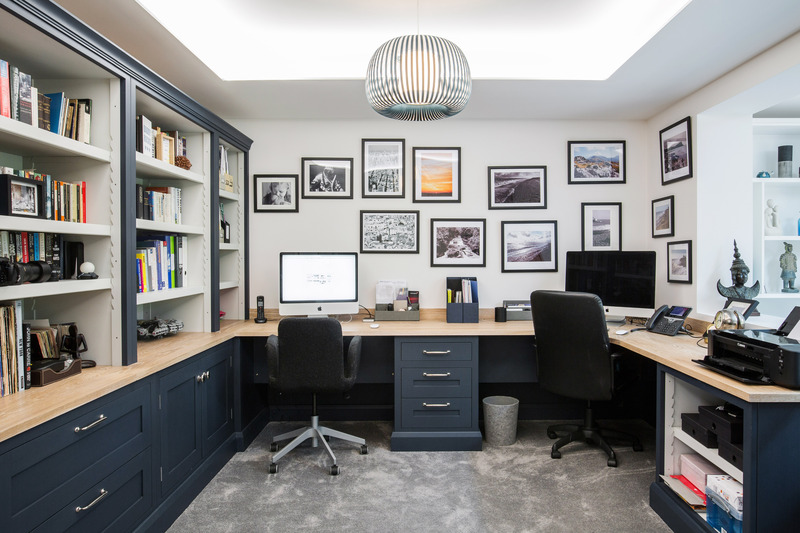 With a busy work schedule and two small children, the homeowners of this recently refurbished family home in Sevenoaks, Kent, commissioned Burlanes to design and create an open plan, organised home office space, that is productive, practical and good looking. Burlanes were also commissioned to create a storage solution for the family's coats, shoes and bags in the entrance hallway. “From the very beginning I felt the Burlanes design team totally understood our needs and what was required for our home. This was definitely reflected in the final design of our home office and bootroom; the installation is absolutely perfect. Thank you." 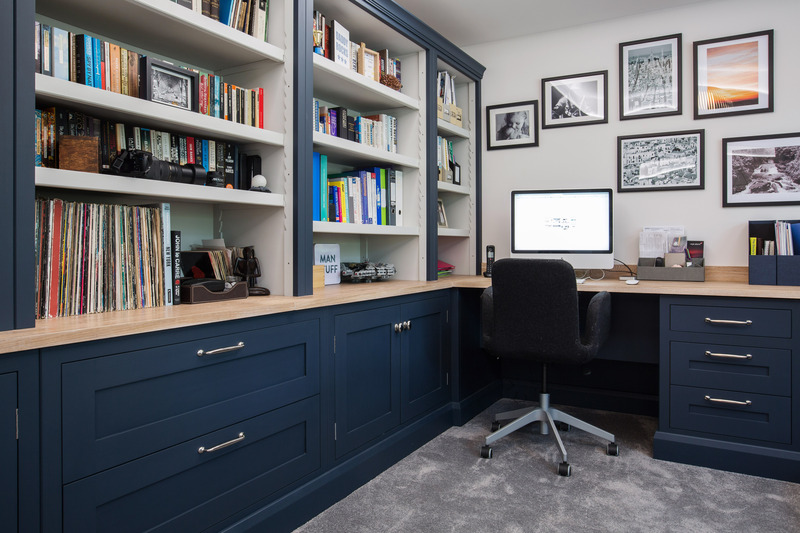 Finding a good home and work life balance is often a challenge for many busy parents, therefore ensuring you have a practical home office space that suits your needs is vital. 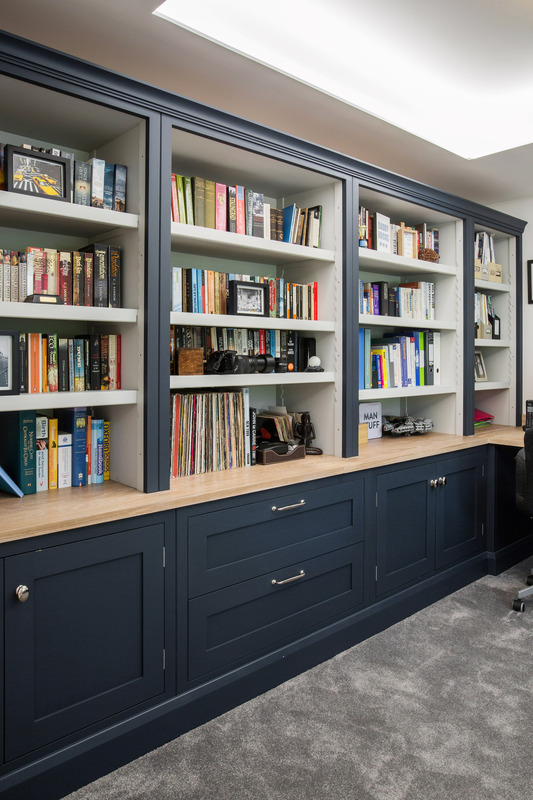 When designing your home office scheme, important factors to consider are storage solutions, desk positioning, shelving and built-in cupboards. 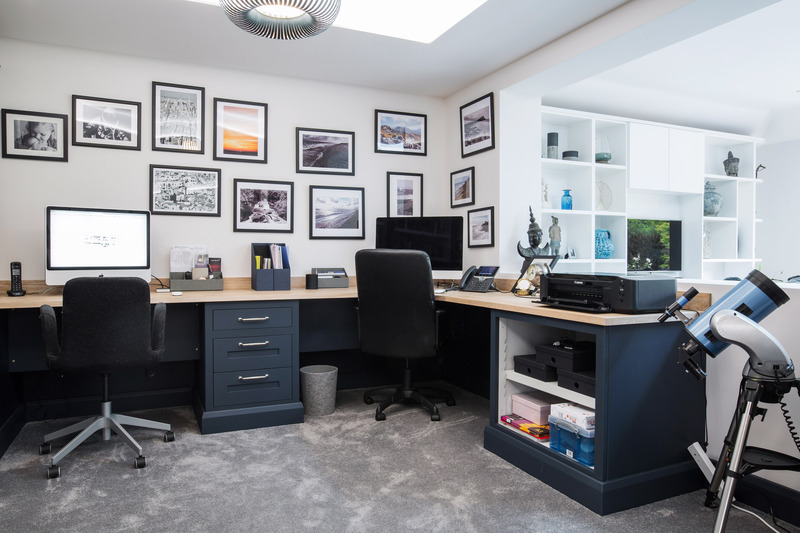 Our design team worked closely with the homeowners to ensure their home office layout was perfect for their needs, and suited their lifestyle well. 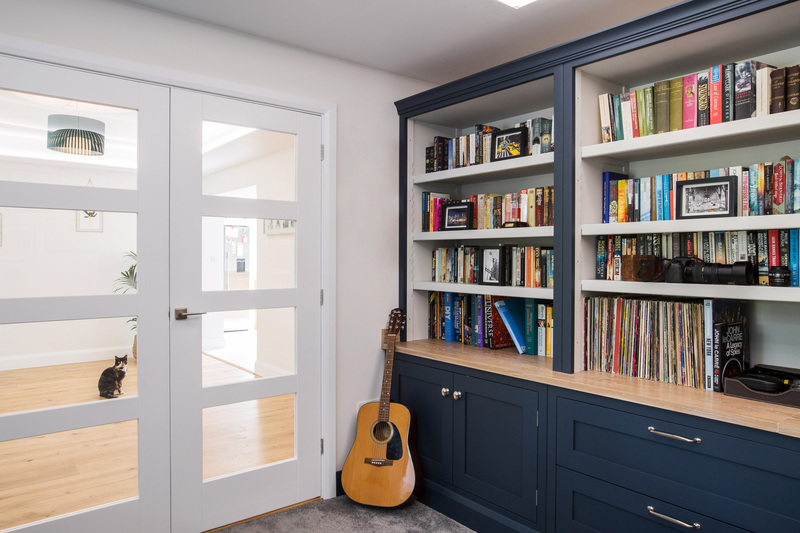 The couple wanted an office environment separate from the family living area, but also a space that could easily integrate if needed, which was created by the opening between the living area and the office. 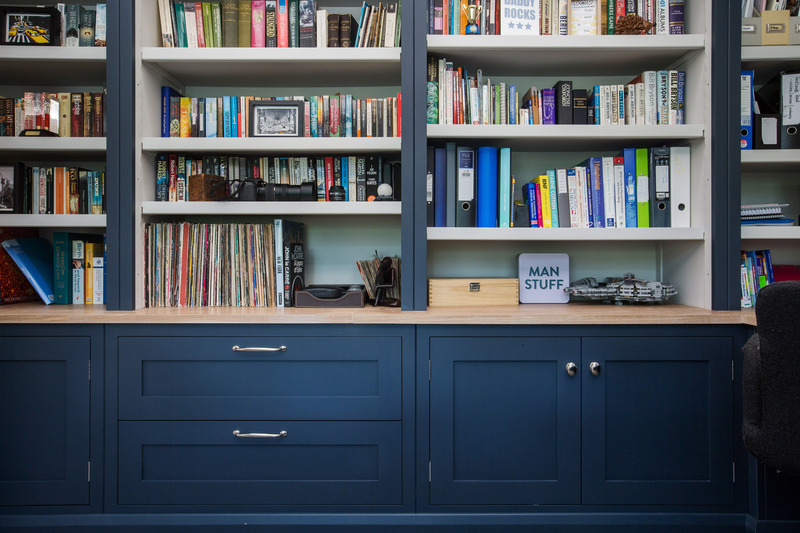 Having enough desk and storage space each was also a vital factor to consider, so the solution was to create a dedicated desk area with plenty of worktop and leg space, and adjoining built-in cabinets and book shelves for storage. Handpainted in Mylands 'Bond Street' and 'Charterhouse', each piece of furniture was designed to fit the dimensions of the room and the available space perfectly. Our furniture is totally bespoke, and designed and handmade to suit your home and lifestyle perfectly, that is why we always ensure our shelves are fully adjustable to any required height, with our Burlanes unique adjustable shelf support system. Each shelf support is handmade by our joiners in our workshop, using high quality tulip wood to ensure a perfect finish, every time. Elsewhere in the home, the family wanted a bootroom style solution to store their coats, wellies, boots and shoes, within easy reach of the front door, but without cluttering up the main entrance hallway of the home. As part of the extension to the rear of the property, a passage way from the back door was created; the perfect space! We designed and handmade a bespoke bootroom storage solution, including a bench seat and coat hooks, providing floor-to-ceiling storage for all of the family's belongings. If you are looking for inspiration or advise on your home improvements, pop into one of our showrooms for a chat with our design team, or call us to book an appointment or home visit.